Our Coin Counter, Wrapper, and Bagger Machines will do all the work that used to take 3 separate tasks to complete. You can choose from either manual or electric Money Counter/Wrapper/Baggers. These "All-in-One" Coin Machines are in stock for fast shipment! 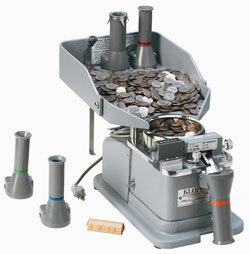 This All-in-One Coin Sorting and Wrapping machine is extremely popular for on-location counting. 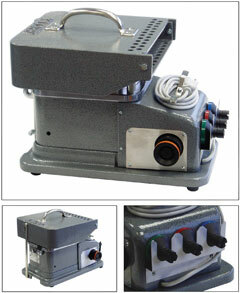 Lightweight and portable, these Coin Counter/Wrapper/Baggers are manually operated with an easy-to-turn balance crank. Simply fold over the coin hopper, grab the handle, and you are ready to take your One Coin Counter anywhere. Choose from 4 "CM line" models (listed in the chart below) to find the best one for your particular needs. Our Electric Coin Counter, Wrapper, and Bagger brings you all the benefits of the CM Model (shown above), but with automation. These Electric All-in-One Coin Machines come in 4 model types (shown in the chart below) with a coin tray that folds over for portability and protection. Each Coin Machines can fill a blank coin wrapper in 4 seconds and will stop automatically when the wrapper is full. Our All-in-One Electric Counter and Crimper Model Counts, Wraps, and Bags U.S. Coins and Tokens, while also Crimping the Coin Wrappers. The crimper is located on the the side of the machine and it allows you to apply a professionally crimped seal to any coin wrapper. 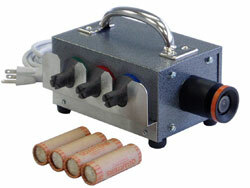 This "total solution" Coin Machine is available with 1 or 4 crimping heads. A storage rack for crimping heads is included when you buy more than one crimping head. Choose from 4 "CECR line" models (listed in the chart below) to find the best one for your particular needs. These Coin Wrapper Crimping Machines can be used with either pre-crimped (shotgun-shell) style wrappers or flat wrappers. Our Coin Crimper applies a tamper-proof rolled edge so coins cannot be removed without evidence or wrapper theft. The machine is available with 1 or 4 crimping heads and a storage rack for heads on the side if you order more than one crimping head with his unit. 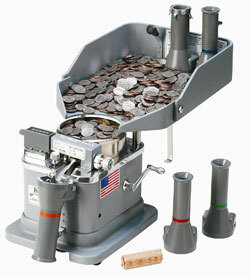 Feel free to browse our other Money handling Supplies including Coin Sorters and our Coin Wrappers.